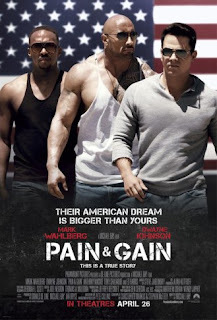 Pain and Gain which stars Mark Wahlberg and Dwayne Johnson is the number movie over the weekend. Tickets sales of $92.2 million were down to 16% compared to last week. Last week's number one movie Oblivion is down one spot to number two while new movie "The Big Wedding" debuts at number four. Completing the top five is the movie "42" sitting at number three while animation movie "The Croods" is down to number five. Here are the top 30 movies for the week ending April 28, 2013.